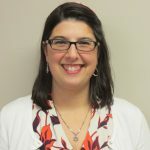 Rabbi Rachael Jackson is the rabbi of Agudas Israel Congregation in Hendersonville, North Carolina, ordained from Hebrew Union College-Jewish Institute of Religion. Prior to rabbinical school, she earned her Bachelor’s degree from Northern Arizona University and worked for a decade as an analytical chemist in biopharmaceutical, biofuel, and hazardous waste companies. These two careers are not as divergent as one might think, for Rachael believes that science and religion are quite similar: while each discipline specializes in its own set of questions, both seek to explain the hows and whys of the world. Science and religion inspire awe, and whether Rachael is working with instruments or working with people, reverence and wonder are constants in her life. The focus of her rabbinate is thus on exploring and imparting the meld of Judaism and modernity, and natural law and Jewish living. She is especially interested in the field of medical ethics, and is a Board member of the Pardee Hospital Ethics Committee and the incoming Vice President of the Interfaith Assistance Ministries.